Croquettes | chit. chaat. chew. When your Best Friend (yes, I made this a proper noun) comes to visit you know you have to pull out all the stops and that includes going down memory at the best tapas restaurant in the city. Hidden along 10th street amongst shrubs, trees, and plants, Alta definitely deserves all its fame and glory. There is always a crowd outside on the sidewalk and plenty of folks waiting at the bar for a table in their intimate two-floor restaurant. Beautiful candles light up the place. It is perfect for a date, and it was even more perfect to reminisce with my Best Friend about our first international trip together, Spain. I’ve mentioned this before but tapas restaurants are kind of my thing for a few reasons: I can order multiple dishes and not feel like pig, there is always sangria on the menu, and last but not least, you get to share with your fellow diners. Remember people, sharing is caring. There are 3 staples on the menu that you must order….no matter what. 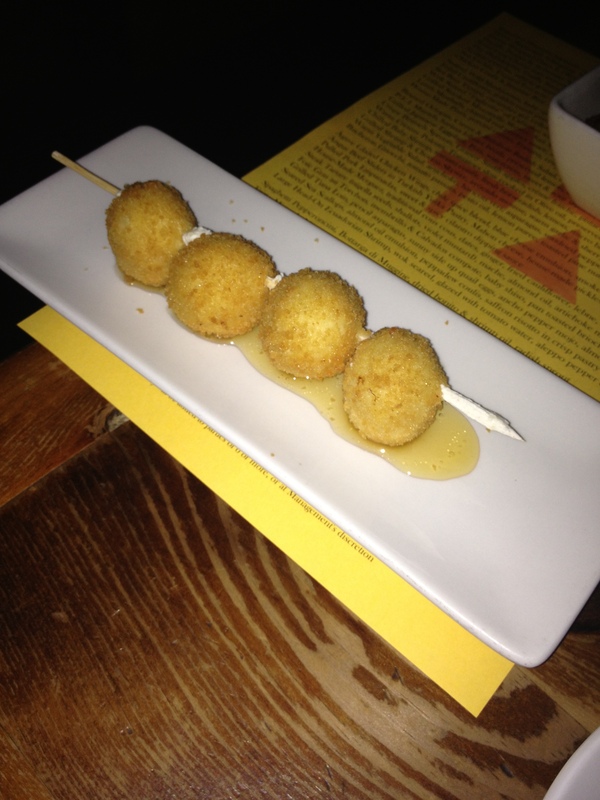 Fried Goat Cheese – 4 fried goat cheese balls are served on a stick on top of a lavender infused honey. When I laid eyes on this dish on the menu I knew this would end up being a happy marriage. Goat cheese and honey are still going on strong. The floral note adds a nice sweetness with the tangy, creaminess of the goat cheese. This is not a light cheese dish in any shape or form so be ready for the crispy, smooth, sweet, deliciousness that is to come. 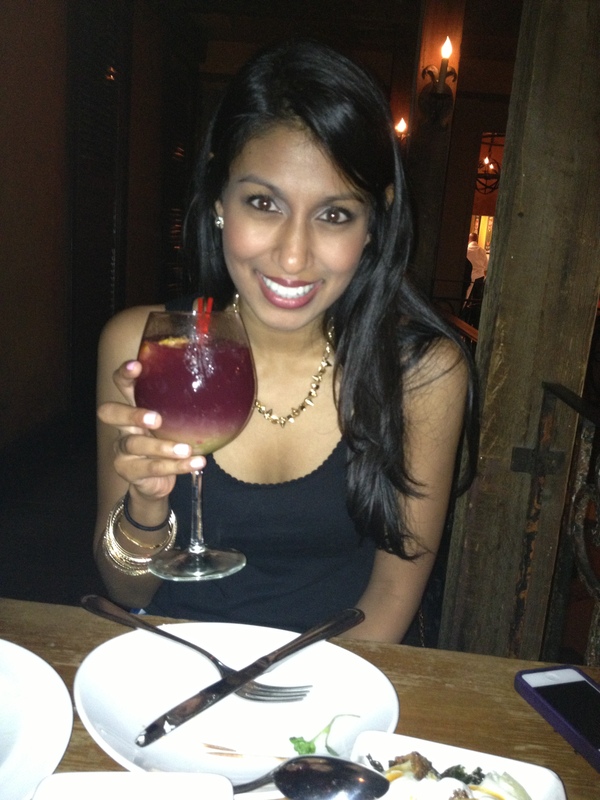 Bacon Wrapped Dates and Olives – 6 delectable treats came just in time for us to enjoy our first glass of red sangria. These are stuffed with almonds and provide a balance of sweet and savory. Salty, chewy, sweet, and crispy. It takes skill to get all those adjectives in one bite. 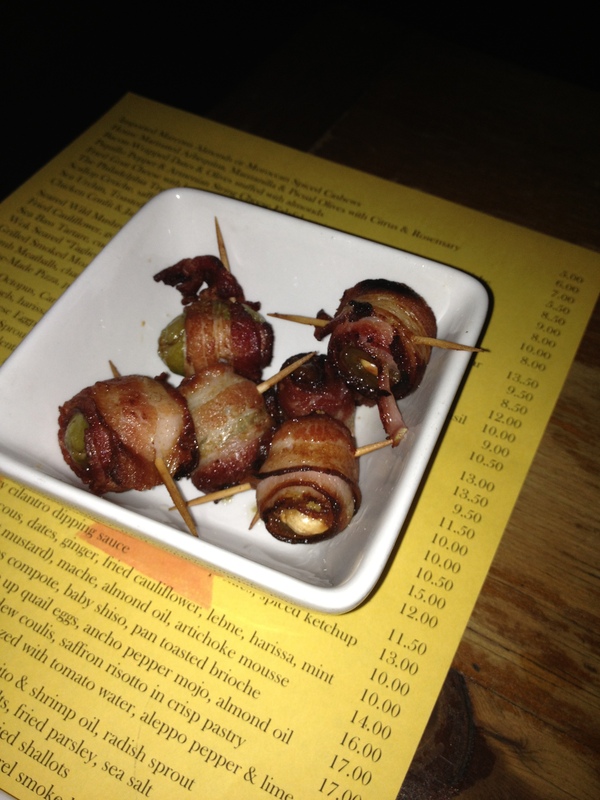 I enjoyed the olives more than the dates only because it was my first time having them paired with bacon. I should have known….bacon anything is always good. 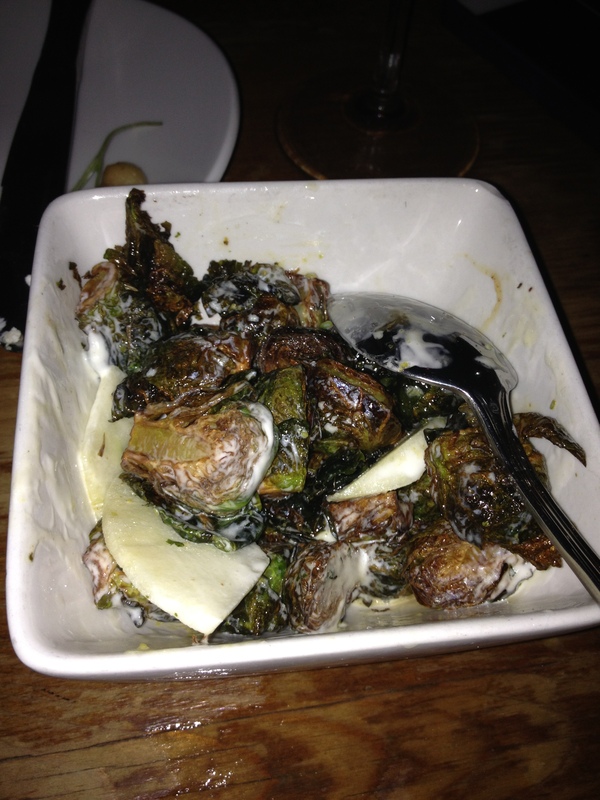 Crispy Brussels Sprouts – These are the best Brussels sprouts I have ever had. in life. hands down. There is absolutely no competition in sight. This is one the most popular dishes at the restaurant so don’t skimp on these because you are afraid of green vegetables. 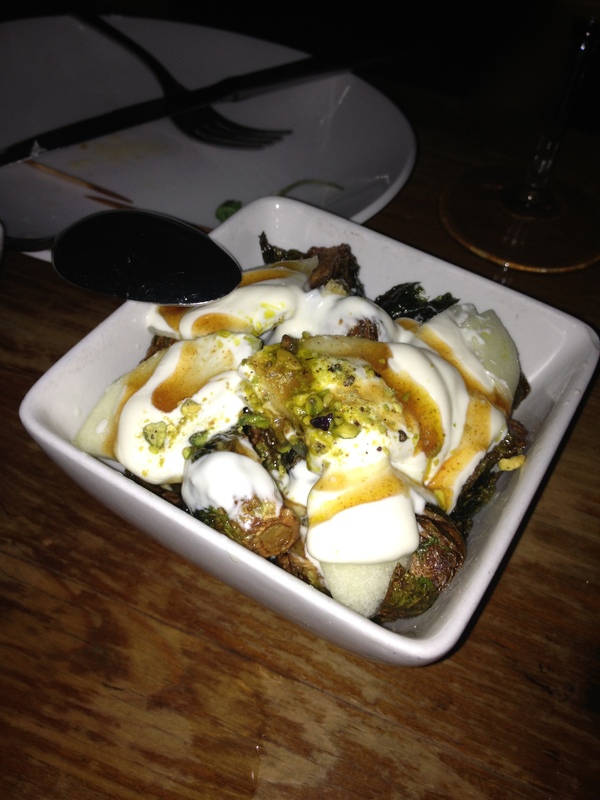 They come with Fuji apples, creme fraiche, and pistachios. The apples added some bite and freshness to the dish. The pistachios enhance the crispiness. The creme fraiche provided a sour note that creates balance. This is the type of balance that makes you vow to never give the stank eye to Brussels sprouts again (for all the Brussels sprouts haters out there) or to place an order for 2 helpings next time you visit (for all the Brussels sprouts lovers out there). Here are the before and after shots. It is important that you mix thoroughly so that every bite is amazing. This is Best Friend approved. Look how happy she is! Which of the 3 dishes do you think you would enjoy the most? I think you can tell which one mine is! In need of a casual dinner spot to take your out-of-town friend on a weekday? 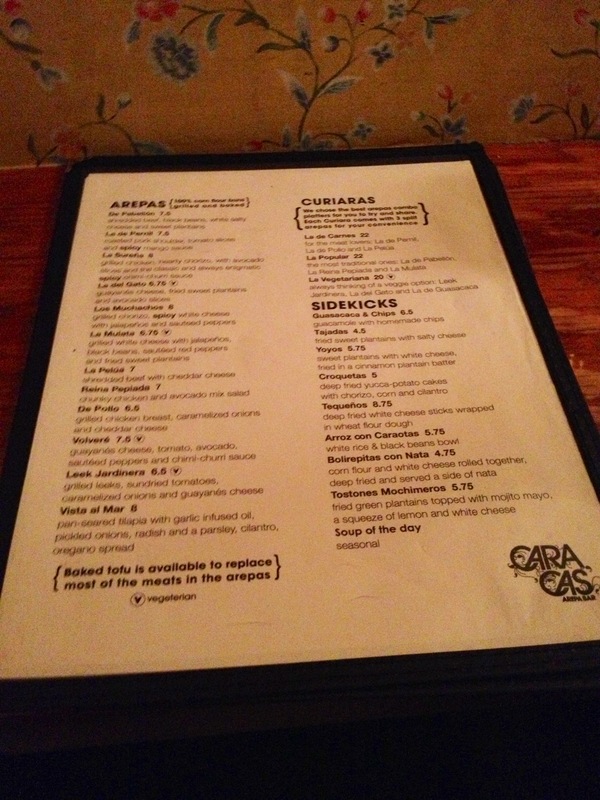 Look no further than Caracas Arepa Bar. 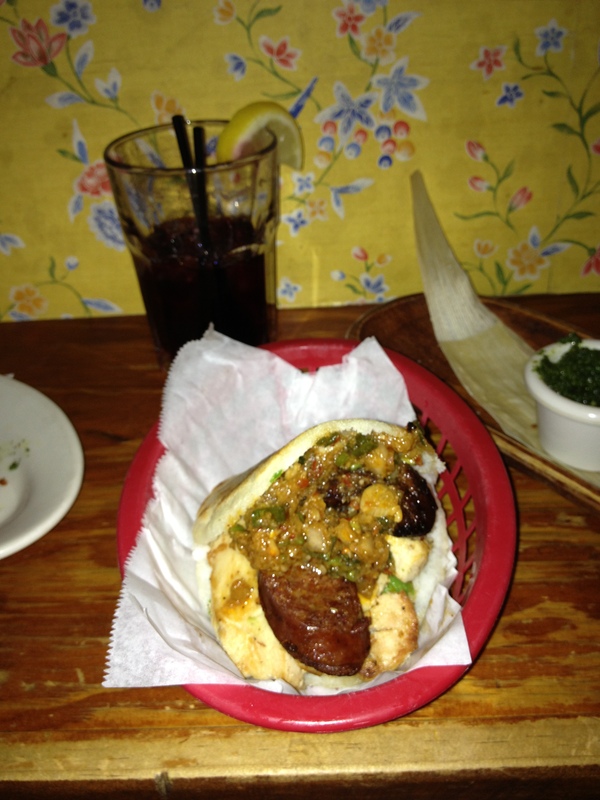 Arepas are….heaven. They are a flat, round, South American pita pockets made from ground corn dough or flour. They are stuffed with delicious goodies like juicy meats, cheeses, avocados, plantains, and much more. 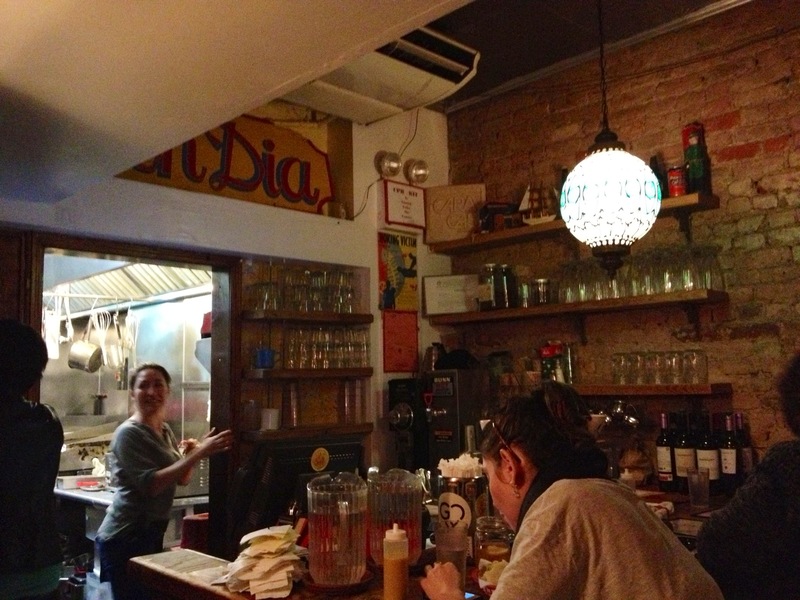 A good meal all wrapped in one, the arepas at Caracas Arepa Bar have become a East Village staple. It seems all the good places to eat in this city don’t take reservations. Expect a decent wait (we waited about an hour for a table) but don’t fret, there are plenty of bars on the block. 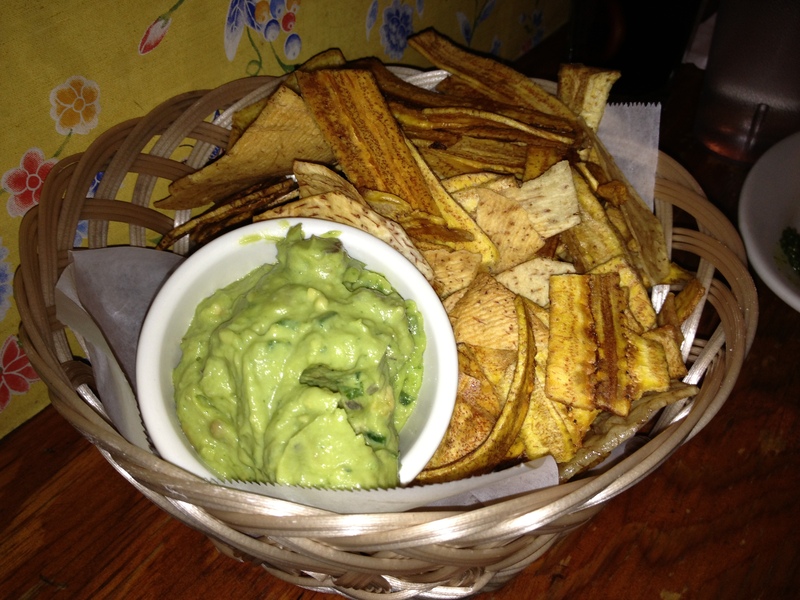 Guasacaca and Chips – guacamole with some house made chips was a necessary move. One order would have been perfect for 4 people. The chips were crispy and the guacamole was the right amount of creaminess. Combined with the corquetas we were heading towards a night of food indulgence. Corquetas – divine. 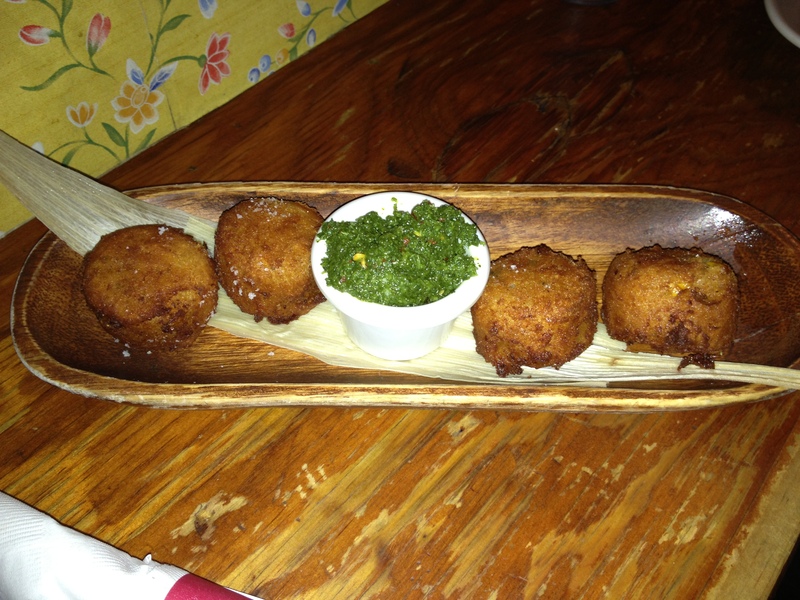 The are made from yuca, chorizo, corn and cilantro . 4 of these bad boys are served with their signature chimichurri sauce which was packed with intense flavor. I think chimichurri is going to be added to the my shelf of condiments in my refrigerator (next to the 4 bottles of hot sauce, 3 jars of mustard, and the steak sauce.) They came out fresh of the frier which made them a nice balance with our glass of red sangria. La Surena – This arepa combined all my favorite things: chicken, chorizo, avocado slices, and that amazing chimichurri they gave to me earlier. I devoured it. The meats were balanced with the freshness of the avocado. The chimichurri provided the right kick the arepa needed. This meal was easy on the wallet with arepas costing less than 10 bucks a pop. A gem in my new favorite neighborhood in NYC. East Village, you never disappoint me.